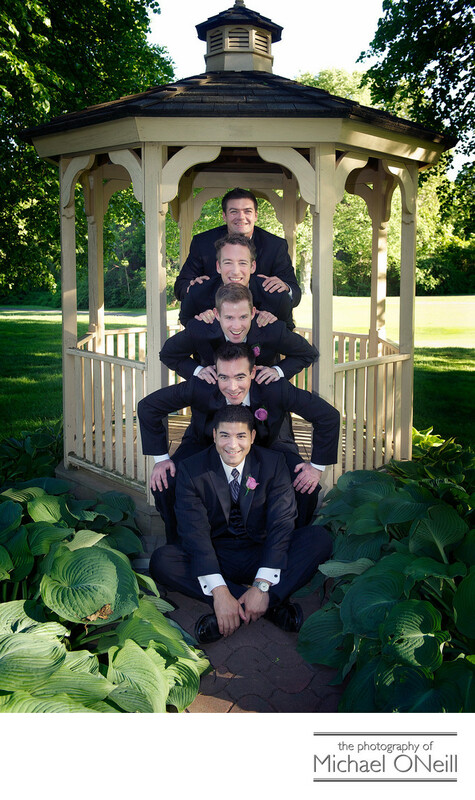 Another fun picture of the groom and his groomsmen. This photo was taken at the wedding reception venue, The Woodlands, in Woodbury, New York. I had a lot of fun with this group. I had worked with some of them before as I had photographed the best man’s wedding prior to this one. That is one of the greatest things about this business...any business for that matter. If you do a great job, your clients will become your best "salespeople", referring their friends and families to you. I am proud of the fact that some of my clients have referred me to friends and family for generations. This wedding started with the bride’s preparations in the bridal suite of The Garden City Hotel, one of the finest establishments on Long Island, NY. After the wedding ceremony at church the bridal party got together at The Woodlands for this fun photography session. The wedding reception followed with a night of fine dining and spirited dancing. This was the second wedding I photographed for this family and I have stayed in touch with the couples; creating beautiful newborn portraits of their children as they started families of their own.